ECIL Recruitment 2018 – Apply Online for 84 Graduate Engineer Trainee Posts :- Electronics Corporation of India Limited (ECIL) has issued notification for the recruitment of 84 posts of Graduate Engineer Trainee (GET) through GATE-2018 examination. Interested & eligible candidates can apply online through official website of ECIL. Online Application will start from 16/01/2018 and the last date for submission of online application is 15/02/2018. Age Limit: 25 years as on 31/12/2017. Educational Qualification: First Class Engineering Degree with minimum 65% marks in aggregate (55% for SC/STs) from AICTE approved Colleges / Recognized Indian Universities in the relevant discipline. Application Fee : Candidates belonging to General/OBC category (including non – creamy layer) has to pay a nonrefundable application fee of Rs. 500/ – (Rupees Five Hundred only). 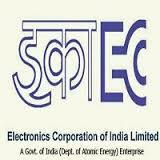 SC / ST / PWD/ Ex Serviceman and regular employees of ECIL are exempted from payment of Application fee. Commencement of Online Application :16/01/2018. Last Date of Online Application : 15/02/2018. How to Apply: Interested & Eligible Candidates can apply online through http://careers.ecil.co.in from 16th Jan 2018 to 15th Feb 2018. Electronics Corporation of India Limited (ECIL) has published notification for the recruitment of 275 posts of Trade Apprentices. Interested & eligible candidates can apply in prescribed application format. Last date for submission of application is 04/10/2017. Age Limit: Candidate should not be less than 14 years of age as on 01/10/2017. Educational Qualification: ITI Pass Certificate in the respective Trades. Last Date for Receipt of Applications : 04/10/2017. How to Apply: Interested eligible candidates can send their application in prescribed format along with all necessary documents to the Deputy General Manager (CLDC), Nalanda Complex, Near TIFR Building, ECIL – Post Hyderabad -500062, Telengana State. Last date for submission of application is 04th Oct 2017. Subscribe our Sarkari Naukri Alert Mail Service for ECIL Recruitment 2018.